Did you ever track the number of hours you spend keeping your flower beds free of weeds? I don’t even bother because tracking my time doing this task could easily discourage anyone from having a garden! What is really important here is to understand weeds – yes – actually understand those pesky things! That will allow you to win over them and give you more time ot enjoy your beautifully groomed garden. Keep in mind that every square inch of your garden has weeds in it – but only those in the top inch or two of soil get enough light to trigger germination. If you decide thsat you want to remove weeds by digging and cultivating, you may actually be making the problem wore by exposing dormant seeds to where they can grow. Do dig only when you have to, plant what you need to and immediately cover unplanted soil with mulch. In your lawn, the best way is to sever roots with a sharp knife – that will take way their food source. It is better then digging them out. Mulch, Mulch,Mulch – if you do that, you will be keeping weeds away from light. Organic mulches in particular can actually host crickets and carabid beetles and they love easting away thousands of seeds. Some light will pass through the mulch and it is important to replenish the mulch as needed to keep it at least 2 inches deep. Weed your garden when weeding is good – this goes by the old saying: “Pull when wet, hoe when dry”. That simply traslates to putting your gloves on after a nice rain and attacking your weeds. Another helpful tool is an old kitchen fork – that will help you pull out the weeds easily. If you try to do this in dry conditions, all you will be doing is breaking the weeds above their roots and wasting yiour time. Deadhead as many weeds as you can and fast! 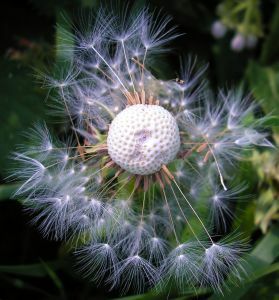 When you can’t completely remove the weeds, take off their blooms before they go into seed. Cutting back the tops of perennial weeds, such as bindweed will force them to use up their energy abd food reserves to supply roots and that will limit their spreading. Filling the gaps between plants in your flower beds will go a long way to having a weeds free garden. When planting, I usually reduce the recommended spacing by at least 25% and keep an eye on weeds sprouting out until plants have a chance to fill in the spaces. Water the plants that need water and not the weeds. Putting soaker hoses beneath the mulch effectively irrigates the plants, while leaving nearby weeds thirsty. DOin this will reduce weed germination by at least 50%. The one thing you will need to watch out are deeply rooted perennial weeds – especaiily in the areas you are keeping moist – and they can take off really fast on you! Quite a few gardeners and also scientists believe that enriching your soil with organic matter is extremely helpful For some reason – weed seeds do not germinate as quickly in organically infused gardens – for example one that keep getting regular additions of compost. Hope this was helpful to you and I will very much appreciate any other suggestions and tips you may have to share!